This summer's European Championship in Portugal is the 12th in the tournament's history. The USSR won the inaugural finals in 1960, with the competition then known as the Uefa European Nations Cup. The championship has grown in stature and importance since then and produced many memorable moments. Here we look at six of the best. 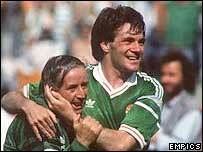 The 1988 finals were the first the Republic of Ireland had reached and the draw for the tournament handed them an opening game fixture against England. The press gave the Republic, managed by Jack Charlton, no chance against a highly fancied England team that included John Barnes and Gary Lineker. But Charlton and his team of journeymen revelled in defying the odds and the match was settled when Ray Houghton's looping header sailed over Peter Shilton and sent the green army of Irish fans into rapture. England never recovered, losing their other two group games. Ireland drew with Russia but lost to Holland in their crucial third match and just missed out on the semi-finals. 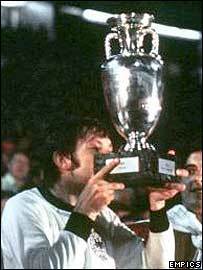 Czechoslovakia won the tournament in 1976, and if one moment crystallizes their victory it was Antonin Panenka's penalty in the final. The unfancied Czechs defeated the mighty Soviet Union and Holland on their way to the final where they came up against a West German team boasting Uli Hoeness, Berti Vogts and Franz Beckenbauer. Bernd Holzenbein scored a last-minute equaliser for West Germany. And following 30 minutes extra-time, the match went to penalties. After Hoeness missed the target, Panenka stepped up knowing that if he struck the ball past Sepp Maier the cup was Czechoslovakia's. Panenka strolled up and chipped the ball down the middle of the net with barely enough force to carry it across the line. Maier had dived to his left and could only watch in horror as the ball, almost carried by the wind, drifted over the line. The 1984 European Championship had been a feast of football, with France delighting the home crowds with some breathtaking football. The home nation had progressed well through the group stages. 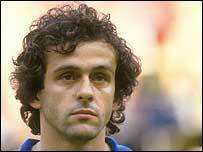 Midfield maestro Michael Platini was in his pomp and the entire nation was crying out for their team to go the whole way. But Portugal stood between them and a place in the final. White French cockerels wandered around the pitch before the start and a nation bit its nails. When the action started a classic ensued. The home team led for most of the match but Rui Jordao first equalised and then put Portugal ahead, 2-1, in extra-time. France, who had missed numerous chances, restored parity with Jean-Francois Domergue's second goal of the match before skipper/hero/genius Michel Platini fired in a winner, with penalties just a minute away. The two nations met again in another classic Euro semi-final in 2000. Again France won in dramatic fashion, with Zinedine Zidane scoring a Golden Goal penalty. Most of the Denmark squad were on holiday when Yugoslavia's late withdrawal handed them a second chance. And so began one of the most remarkable stories in football history as Richard Moller Nielsen's team went all the way to win their first major tournament. A draw with England and a shock win over hosts Sweden was enough to take Denmark through from their group. 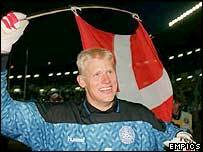 Next came holders Holland and a thrilling contest that went all the way to penalties, with Peter Schmeichel making a dramatic save from Marco van Basten to take his team through to the final. By this stage it almost seemed Denmark's destiny to win and so it proved as Nielsen's team beat Germany 2-0. The Germans might have walked off with the main prize but it will be remembered as the tournament that brought England together. Who will ever forget Paul Gascoigne's wonder goal against the Scottish at Wembley? 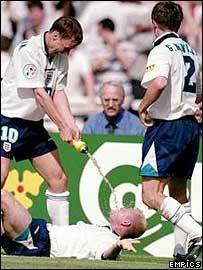 It turned out to be Gazza's swansong at international level but what a way to sign off, turning Colin Hendry inside out and celebrating by replicating the infamous pre-tournament dentist's chair incident. Terry Venables' team also thrashed the talented Dutch with the best display by an England team in decades. Throw in the penalty shoot-out win against Spain and David Seaman's spot-kick save against Scotland and the tournament was a rollercoaster of emotions that put the pride back in English football. Of course, it all ended in predictable fashion for England when they lost to Germany on penalties in the semi-final. The volley Holland striker Marco van Basten scored against the Soviet Union in the 1988 final is arguably the best goal in European Championship history. Van Basten was in electrifying form throughout the tournament and had already left England's hopes in tatters with a brilliant hat-trick. But he saved his best for the final. 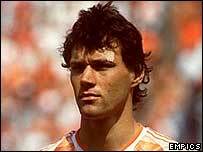 Ruud Gullit's goal had put Holland in front before Van Basten's strike simply dazzled those watching. It did not seem possible to score from where Van Basten was positioned when Arnold Muhren's cross reached him. But standing virtually on the bye-line at the edge of the penalty area, the Dutch hitman unleashed a thunderous right-foot volley that nestled in the top corner of the opposition net. "I thought Van Basten was going to control the ball," said Muhren. "I don't think many players would have even thought to shoot from that angle. There was great disbelief."